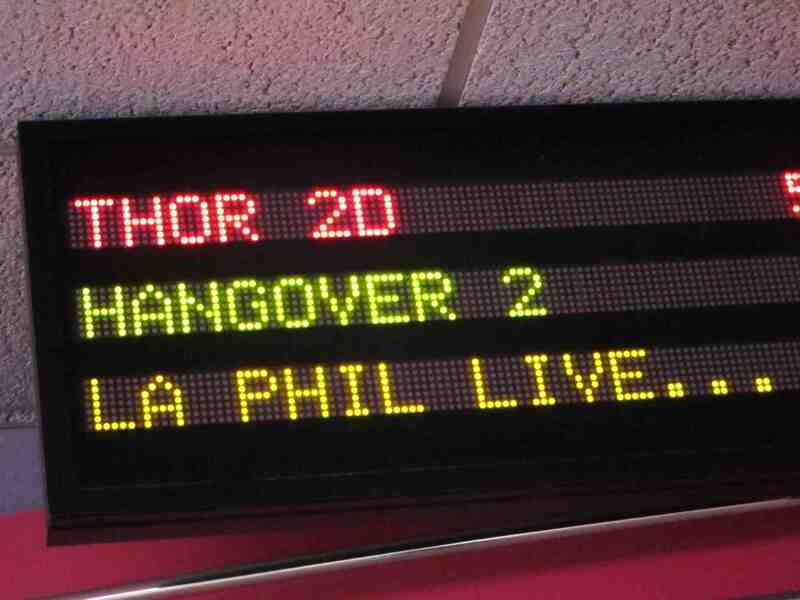 Apparently, the Los Angeles Philharmonic Orchestra has had as much success with its “LA Phil Live” hi-definition, satellite-broadcast live concerts as has the Metropolitan Opera, which started this whole ingenious marketing move to reach outside the groups’ home cities and halls. When I went to the all-Brahms concert (below) on Sunday, June 5 – I went to Point, but it also played at Eastgate –- LA Phil president and CEO Deborah Borda, who landed Dudamel for LA, said the broadcast went out to over 400 cinemas around the globe and would go to even more in the future. She also said the next season would be announced soon, by the end of June, along with the release of the recorded live performance of Brahms’ fabulous and popular Symphony No. 4. That sounded like a good choice of natural timing. Unfortunately, the other piece on the program, the great Double Concerto for Cello and Violin, has not been recorded for release, at least not to my knowledge. 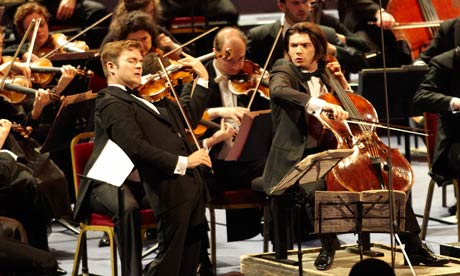 Perhaps there were contractual difficulties with the soloists, the Capucon brothers – cellist Renaud and violinist Gautier (below performing the same piece at the BBC Proms) — who did such an outstanding job. I didn’t post a review, by the way, of the concert. But my colleague Greg Hettmansberger did, and I find it a very fair assessment. The music was certainly worth the $18 ticket, as was the chance to look around the impressive Walt Disney Hall by architect Frank Gehry; to see and hear how a conductor rehearses an orchestral; and to go behind the scenes with both the conductor and the soloists with host actor John Lithgow. I too found both Brahms performances lively without being rushed, full of vitality and energy as well as some fine subtleties. It renewed my conviction that Dudamel is the real deal, and I look forward to hearing more from him – especially in the LA Live programs in coming seasons. Now, if only I could find out when they are playing and what they are playing for the next season. Anyway, the symphony is indeed now available, later than first announced on iTunes – and only on iTunes. It costs $5.99 for the download. Apparently, there are no plans for Deutsche Grammophon to release it as a regular CD. The Ear thinks that is too bad and a terrible business decisions. With someone as popular a phenom as superstar Dudamel, any release should be in all formats, especially these great and well-known works by Brahms. Does anyone know anymore about the next season of the “LA Phil Live”? 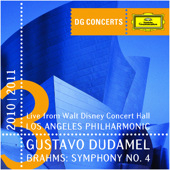 What did you think of this past season and of Dudamel in general? I agree that it’s horrible that it won’t be released on CD. That means that any of us who don’t have an ITunes subscription (and yes, there are still some who don’t) wpn’t be able to hear it. You would think that now that the album has won a Grammy, Deutsche Grammophon would take the hint and do so. It does indeed seem a dumb decision. Maybe the Grammy will change their mind. 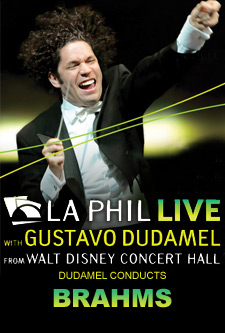 I’ve yet to hear Dudamel’s work with the LA Phil but have seen enough of him via public media to be impressed. In any case, what he did with Venezuelan youth orchestras is simply amazing. My guess is that he’ll be in LA for sometime and perhaps even go up from there. Or at Chicago after Muti. Even Berlin Phil wouldn’t surprise me. He’s young and has as much time as talent. I think Dudamel is the real deal, too. As a conductor, he’s fun to watch– very engaged and just radiating energy. In his interview, he came across as a warm person who clearly must have been be very effective with the youth orchestras he’s led in the past — as well as the L.A. Philharmonic, now.